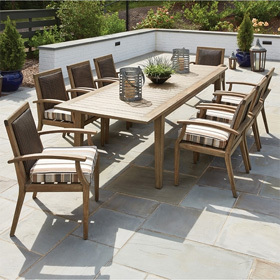 Great for larger families or someone that loves to entertain, the Woodard Colfax Patio Dining Set for Six has even more of what you want to help you have a complete patio. You get four dining arm chairs, two spring dining arm chairs and the Elemental dining table that comes ready for an umbrella and measures 84" by 42". Enjoy great times on your patio secure in the knowledge that the extruded aluminum in your set will stand up to whatever it faces, whether it be extreme weather or extreme amounts of entertaining. You'll also be able to express your style by choosing one of our powder coated finishes. Dining Chair 28.5"W x 28.5"D x 35.5"H 34 lbs. Spring Base Dining Chair 28.5"W x 29.25"D x 35.75"H 50 lbs. Table 84"L x 42"W x 29"H 115 lbs.